Goodreads: "The Glass Castle" meets "The Battle Hymn of the Tiger Mother" in this dazzlingly honest and provocative family memoir by former child actress and current Fox Business Network anchor Melissa Francis. When Melissa Francis was eight years old, she won the role of lifetime: playing Cassandra Cooper Ingalls, the little girl who was adopted with her brother (played by young Jason Bateman) by the Ingalls family on the world's most famous primetime soap opera, "Little House on the Prairie." Despite her age, she was already a veteran actress, living a charmed life, moving from one Hollywood set to the next. 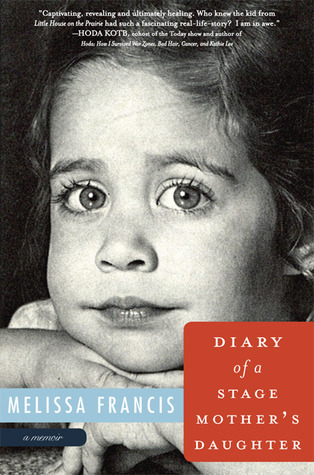 But behind the scenes, her success was fueled by the pride, pressure, and sometimes grinding cruelty of her stage mother, as fame and a mother's ambition pushed her older sister deeper into the shadows. Kritters Thoughts: Although Little House on the Prairie is not the show I know a lot of, I still wanted to read this memoir to hear an insight into the inner workings of childhood stardom and how it affects not only the child star, but the entire family. Melissa Francis takes you into the inner workings of her family to show you the good, the bad and the ugly when you have a child star and a mom who wants nothing more than complete fame. If you have been following this blog for any moment, you know or now you know, I love to read the behind the scenes, the fame doesn't interest me, its the reality behind the fame that I adore. In this book, the reader gets the real deal and I didn't feel like she left any detail out, she included it all and the emotions that were extremely hurt. As a public, we are always wanting the dirt on the star, but what about their family that did not choose the career path that put them in the public eye, those related who are thrust into the fame world whether they like it or not. On another note, this made me stop and take a moment to think about my childhood and what a tame one it was - man, am I thankful. I did take dance classes for 14 years and loved every moment and yes, my mom was a "stage mom," but not for one moment did she make me continue or even think that this would ever be professional, she kept me grounded! A great memoir that takes you into not only Hollywood, but the childhood side of fame in Hollywood and the impact on the family. If you are looking for an inside look, this book will definitely give you the binoculars to see into Hollywood.